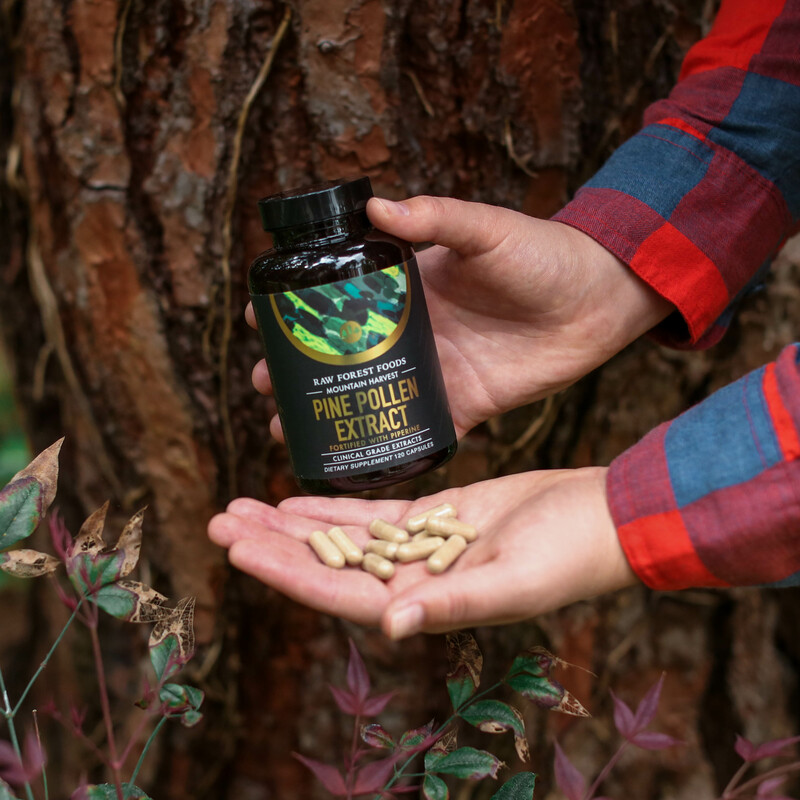 RAW Forest Foods was the first company offering a powdered Pine Pollen Extract. These capsules contain unstandardized Pine Pollen Extract. Most powdered extracts are a standardized 5:1 or 10:1concentration. This one—while unstandardized—is closer to a 50 times concentration. That's a 50:1 extract. This is a pure, full spectrum, unstandardized extract. It's a big deal. We're really excited to be able to offer it to you. Each bottle contains 30 grams of our full spectrum, full potency, unstandardized extract. That's huge. But we're not the only ones that love it. 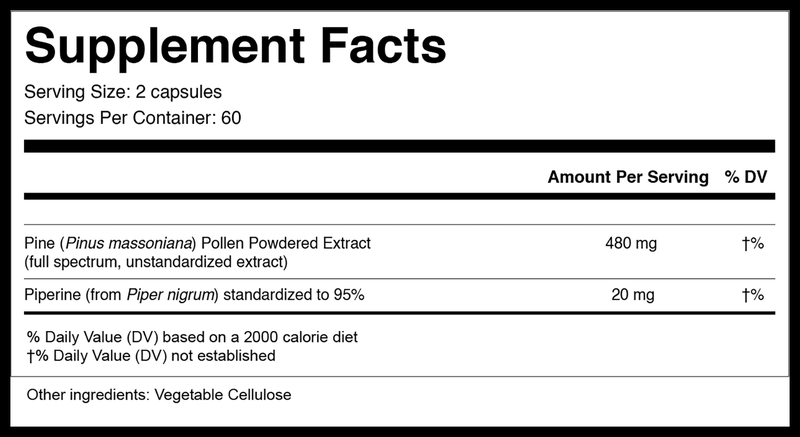 To elevate these, this Pine Pollen Powdered Extract is concentrated roughly 50 times (a 50:1 extract). It begins as Mountain Harvest RAW Pine Pollen and ends as the cleanest, strongest extract available. Piperine is a compound extracted from black pepper (Piper nigrum). Piperine can help increase the bio-availability of some supplements and nutrients, including Vitamin A, Vitamin B6, Vitamin C, Selenium, CoQ10, and Curcumin. * Increased bio-availability is why Piperine is included here with Pine Pollen. It takes just a small amount of Piperine to gain the benefits of it, with effective dosage in the 5 - 20 milligram range. Piperine has been shown to increase bio-availability of Curcumin (turmeric extract) by 2000%. With such a small amount of Piperine required, we are able to add it without reducing the overall amount of Pine Pollen in the product. This is a win-win. Technically, our Pine Pollen Powdered Extract, whether this unstandardized extract or our 10:1 extract is much stronger than any tincture available anywhere. It is just not possible to obtain the high concentration with a tincture as it is with a powdered extract. That’s just a reality. This extract is approximately a 50:1 concentration. It’s made from our pure, RAW Pine Pollen. That means it takes 50 parts of raw material to produce 1 part of extract. By comparison, our tinctures are a 1:2 extract. This is the strongest tincture we find possible when using pure, RAW Pine Pollen as the starting material (which is what should be used). That means it takes 100 times the amount of RAW Pine Pollen to produce 1 part of this powdered extract as it does to produce 1 part of our tincture. That’s a big difference. Compaired to our previous capsules, these take 5 times the amount of RAW Pine Pollen to produce. They are much more expensive to make, and—as of right now—the price is not reflective of the cost. We just couldn’t raise the price in accordance to the actual cost of the product, since our customers were used to paying what they paid previously for the 10:1 extract. We’ll have to change the pricing to reflect this. But for now, we’re sticking with legacy pricing. View our Pine Pollen 10:1 Extract capsules quick facts PDF (Coming Soon). Each bottle of capsules contains 120 vegan/vegetarian capsules (produced with absolutely no fillers, drying agents, or excipients). The dark, opaque color of the bottle helps to protect the inner ingredients from harmful UVA/UVB degradation by the sun and/or light. A transformation of our RAW Pine Pollen into a potent, concentrated extract so that you receive more of what you want from Pine Pollen. Pine Pollen is nutritionally dense, containing important essential and non-essential amino acids, vitamins, minerals, important healthy fatty acids, and more (learn more about the nutritional profile of Pine Pollen here). In Chinese Medicine, Pine Pollen is considered a longevity tonic, promoting healthy, vital aging, so that the body retains youthfulness into old age. 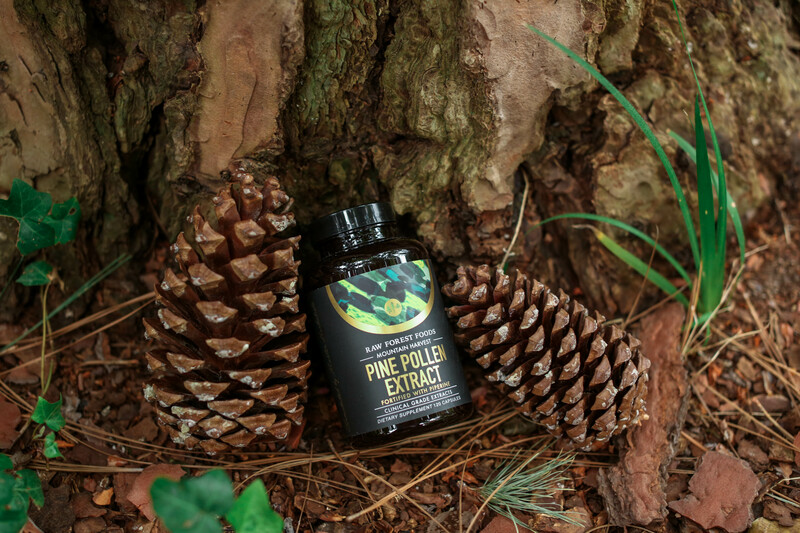 As the first company to offer Pine Pollen, RAW Forest Foods is able to leverage our long-standing relationships to guarantee that only the highest quality pine pollen goes into producing our full Mountain Harvest collection. This is a powdered extract. It is extracted and prepared using the hot water extraction process. This traditional method of extraction results in a strong concentration without the needed use of harsh solvents. The result is a clinical grade, unstandardized extract. At approximate a 50:1 concentration, this is a full spectrum, pure Pine Pollen Extract. Cleaner and stronger. The serving size is 2 capsules daily, or as otherwise directed. Each serving contains 480 mg of Pine Pollen Powdered Extract (full spectrum, unstandardized) with 20 mg of Piperine (Piper nigrum), added to increase overall bioavailability). Other Ingredients: Plant cellulose (capsules). GMO free, and is vegan/vegetarian. Some find Pine Pollen to be highly energizing. Avoid using it late in the day if this is the case. As with all of our products, we advise that these be taken on an empty stomach. Capsules make it very easy to add this product into your daily routine. Of course, whichever way you decide to use it, the best way is the way that ensures regular, consistent use, because no gain is made from a product that sits untouched in the cupboard. This product is not for use by those under the age of 18, who are pregnant or nursing, or who are allergic or methylsulfonylmethane to any of the ingredients contained within.